Successfully Added Mini Bluetooth Audio Receiver - Bluetooth 3.0 + EDR, A2DP, 4 Hours Usage Time to your Shopping Cart. Enjoy up to 4 hours of wireless tech with each charge. The easiest way to equip your car, home, or portable audio device with Bluetooth capability so you can wirelessly stream music from your phone, tablet or computer. 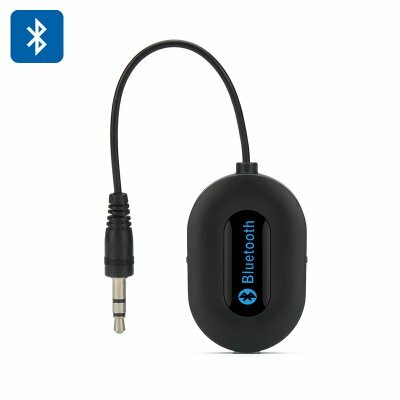 This mini Bluetooth audio receiver connects to the 3.5mm interface of speakers and audio systems rejuvenating them with wireless technology so you can enjoy wireless audio connectivity on all of your devices. The Bluetooth 3.0 protocol with EDR and A2DP offers stable and secure connections with grater data rates and audio quality ensuring you get perfect results when streaming music between devices. The HSP and HFP protocols bring hands capabilities so you can even stream a call through supported devices. You can plug this mini receiver into your car stereo’s Aux port to bring Bluetooth connectivity and will never need to mess with wired connections again or turn you home Hi-Fi into a Bluetooth enabled deices and steam music from your tablet or phone at the next party. The built in battery brings up to 4 hours of usage time and can easily be recharged in an hour and a half. This Mini Bluetooth Audio Receiver comes with a 12 months warranty. Brought to you by the leader in electronic devices as well as wholesale Bluetooth gadgets, Chinavasion..